Lagos – Comedian, actor and talk show host Olateju Oyelakin, a..a Teju Babyface, has been blessed with a set of twins. Oyelakin broke the news on his Instagram page in a post he captioned, “please rejoice with us! 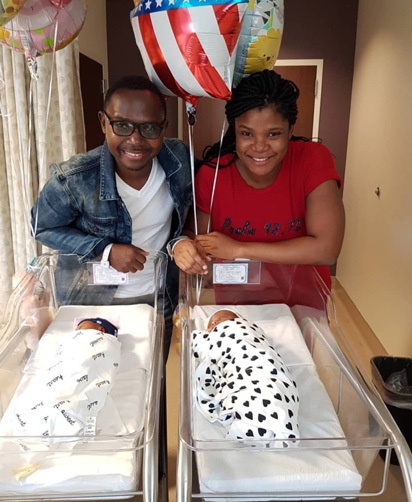 “My wife Oluwatobiloba and I are very grateful and excited parents of twin children. “It has taken almost six years but the Lord, who never forsakes, has given us double joy for our trouble. “I pray that the God whom we serve will remember everyone who seeks Him and give you the desires of your heart’’. Oyelakin, who is the lead mentor at Teju Babyface Mentorship Academy, got married to Oluwatobiloba (nee Banjoko) , an ex-beauty queen, in 2012. According to him, the academy is born out of a desire to train and direct youths on talent development. He is also the producer and host of The Teju Babyface Show which airs on TV stations around the globe.